Some Anti-Virus NDIS or Microsoft Packet Scheduler Miniport can cause NC to fail to connect to the PCS and results in 'nc.windows.app.23790 / nc.windows.app.23791 /nc.windows.app.23712' errors or traffic fails to pass through the NC tunnel. This issue is applicable to Windows platforms, such as Windows XP, Vista, and Windows 7. The issue is with Anti-Virus NDIS and other miniport driver and its binding to the Juniper Network Connect Virtual Adapter. 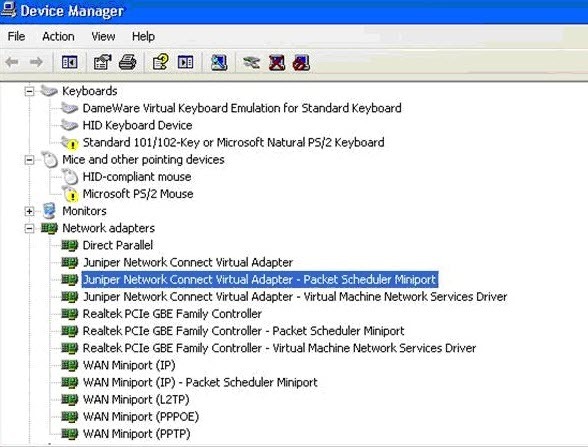 In Control Panel > Device Manager > Network Adapter (click View > Show All Hidden Devices), it will display two more NC drivers such as Juniper Network Connect Virtual Adapter and the other variant of Juniper Virtual Adapter driver (usually shown as Juniper Network Connect Virtual Adapter - Packet Scheduler Miniport or <some manufacture> NDIS). This causes several issues as the Anti-Virus NDIS Filter or Miniport are intermediate-drivers that bind to the primary NDIS (such as Juniper NC driver). The established network connections might be broken during the application installation, as the intermediate driver is not properly passing the packet to Juniper Network Connect Virtual Adapter; so the user might receive the 23790, 23791, or 23712 error or no traffic is properly passed through. The nc.windows.app.23712 error is noticed, as the Juniper Network Connect virtual adapter is not getting installed. Remove or disable the additional Juniper Network Connect Virtual Adapter with Packet Scheduler Miniport or NDIS binded to it. Go to Control Panel > Administrative Tools > Computer Management. Click View and then select Show hidden devices. Right click Juniper Network Virtual Adapter - Packet Scheduler Miniport. KB9216 - Network Connect: How do I check if the software installed on my client station is preventing access?